Perugia is a lovely medieval city located in Umbria. Rich in history and art, its surrounding are witness to both the Etruscan and the Roman civilizations. The modern part of town is identified by the presence of its prestigious university, home to thousands of Italian and International students. Because of this, Perugia has all the lively characteristics of a typical university hub, and it is full of interesting attractions, restaurants and night spots. Because of its location, it is also perfect as a starting point for daily excursions to places such as Assisi, Spello and Gubbio. From the 6th to the 1st century BC, Perugia was part of the Etruscan kingdom, and came under the Roman rule around 40 BC. The town is still rich of archaeological sites, witness to those times. The most outstanding of all are its walls and gates, which are still well preserved. Visitors can then enjoy the charm of the old city as well as catch a glimpse of modern day life. 168,418 inhabitants. Right in Umbria, one of the regions in the center of Italy that is becoming a major stop for American tourists, Perugia is a couple of hours drive north of Rome. Perugia is a hill town about 400 meters above sea level and like most cities in central Italy, Perugia was an Etrurian settlement absorbed by the growing Roman Empire, making it a city that has diverse traditions and architectural styles. On this note, it is possible to visit the Etrurian Well that is not only an historical site, but is today still the main water source in the city. Besides the well, there are many Etrurian tombs, many of which are the most well preserved examples of this culture that didn’t leave much behind. After the Etrurian period and the Romans, Perugia developed as any other medieval city and churches and palaces started to be built, and are still standing for the amusement of the tourists; among all of them, we remember the “Palazzo dei Priori” that took around 150 years to be built and it was finished in 1443, and today is the home of the City Hall. But, as said, the main historical attractions are definitely represented by the numerous churches that vary in style and size, but all equally worth a walk thru. The San Lorenzo Cathedral is one of them, as it is also nice to visit the San Severo chapel, which features a beautiful fresco from Raffaello. Perugia is the home of the largest international university in Italy and one of the most prestigious in Europe. So far, about 8000 foreign students attend the classes every year, making it a very international environment. 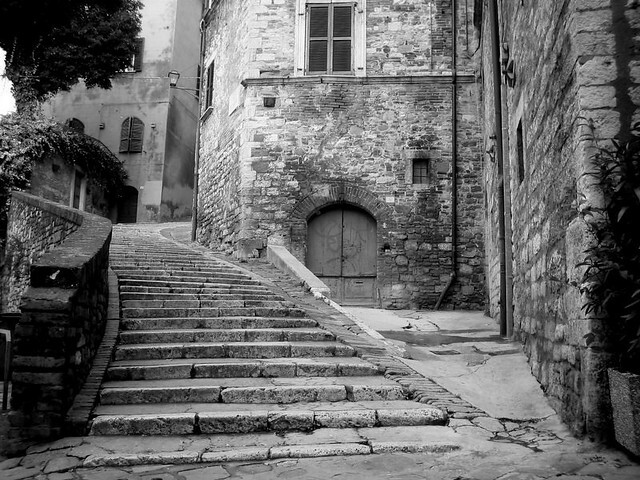 Unfortunately, in recent years Perugia and its university made front page news for the murder of Meredith Kercher. This case attracted the interest of the international community, as the victim was British, killed on Italian soil, and one of the convicted killers is an American citizen. Perugia is not only international because of its university, as every year it hosts the Umbria Jazz festival, one of the most important jazz events in the entire world. The event usually attracts some of the best players from the U.S. and their European counterparts, for amazing concerts under the Umbrian summer sky. Umbria Jazz occurs in July. Another international event is the International Journalism Festival that takes place in April and attracts journalists and sympathizer from all over the World. On the financial side of things, Perugia’s economy is mainly driven by agriculture and small to mid-size companies, which seems to work extremely well as Perugia is a wealthy city. It is also the home of the food icon “Perugina“, maker of the famous chocolate “Bacio” (kiss). Perugina is an Italian brand that grew in the Italian economic boom, and in recent years it was sold to Swiss giant Nestle. This lovely medieval structure was built during the 13th century and underwent numerous modifications over the years. Here, you can come across some beautiful frescoes in the Sala dei Notari, as you climb up the stairs along Piazza IV Novembre. As you enter the palazzo through Corso Vannucci, you will come across the Galleria Nazionale dell’ Umbria, which has an extensive collection of art from the Umbrian region, dating back to the 13th century, up to the 19th . This gallery also showcases some beautiful works of art from local painters. Inside the Collegio della Mercanzia, one can find exquisite panels of wood and inlays designed by German craftsmen during the 15th century. In the Collegio Del Cambio, you will be able to enjoy Perugino’s frescoes from the 15th century. This is the city’s main square, already present in Etruscan and Roman times. In medieval times, it was the center where the town 5 major roads crossed each other. Piazza IV November is still today at the very heart of Perugia and it is often a gathering place for the youngsters that populate the city. Every year, during the summer time, the popular Umbria Jazz Festival takes place, attracting numerous visitors and music lovers from all over the world. In the centre of the square is Fontana Maggiore (Major Fountain), the most important monument in Perugia, completed in 1278. The fountain is an incredible example of sculpture and it portrays diverse subjects that go from the zodiac signs to the months of the year, as well as important historical moments of Rome and even scenes from the Bible. The upper section of the fountain features great statues. The Church of San Severo was originally built on the site of a Pagan temple and it was again reconstructed during the 18th century. It is especially known for a frescoed 14th century chapel within its walls. The upper part of the church was painted by Raffaello, whereas its lower part is the work of Perugino. This small church has a lovely façade and was built in the honor of Saint Bernardino. You can come across some interesting combination of colors used here including rose, aqua and white. 14th century bas reliefs and sculptures are also part of the interesting artistic wealth of this building. The main altar has been designed from the 4th sarcophagus of the Blessed Egidio, once a friar follower of St. Francis of Assisi. This Benedictine Abbey was founded in 10th century, but its best features date to the 15th and 16th . It comprises an interesting collection of Renaissance art and paintings, including frescoes by Raffaello, Vassillacchi, Perugino and Parmigiano. It also has one of the finest 16th century wooden choir in Umbria. Just around 13 km from Perugia, you can visit this village perched on a hilltop, from which you can enjoy an amazing view. Corciano is easily reachable from Perugia by bus. The service departs every hour from Piazza Italia, and the trip takes about 45 minutes. Perugia is served by a small but efficient airport, Sant’Egidio, located at about 12 km from the town center. Bus and train services to and from the airport are available, and are usually based on the scheduled departure and arrival time of flights. Another option is to fly to Rome, which is a mere three hours away. From Rome, you can travel by train (a cheap and efficient option), or opt to rent a car and take the A1 highway in the Milan direction. 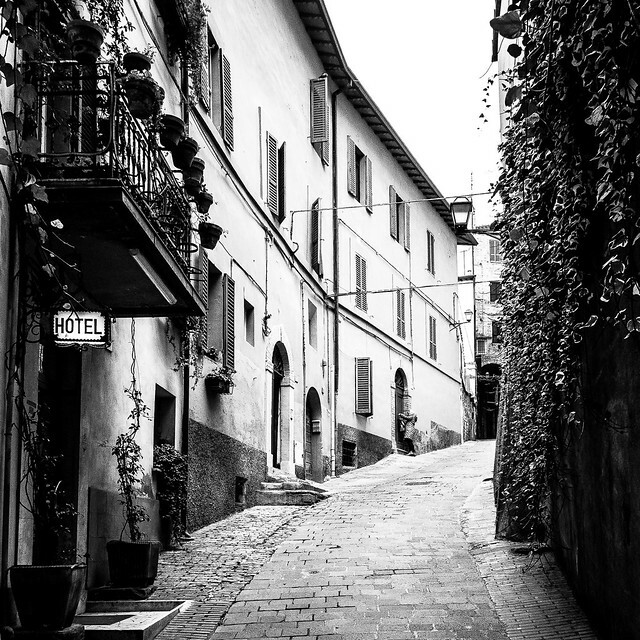 Perugia offers a wide range of hotels and accommodation. Most of the hotels include swimming pools and car parking. You can book in advance to avail of some special discounts and choose the best room as per your liking and preferences. There are also plenty of Bed & Breakfasts. Apartments to rent are also offered to travelers who wish to enjoy more privacy and comfort amidst these amazing surroundings. In Perugia, you will come across numerous restaurants, offering some of the finest Umbrian cuisine. Typical dishes on offer are roasted pork and delicious varieties of pasta. You can also find plenty of pizza outlets and there are some good takeaway options as well. Family owned restaurantsoffering some great food amidst a lovely ambience are also popular in town. Perugia is home to the famous Casa del Cioccolato Perugina and every October hosts the Eurochocolate.